True story – I used to not like sweet potatoes. Well, I thought I didn’t like sweet potatoes. What I discovered in my twenties is that I didn’t like sweet sweet potatoes. You know, the ones that look more like dessert on the Thanksgiving table. Then we were invited to a friend’s house for dinner and they were serving sweet potatoes. Not wanting to be rude I took a few and much to my surprise – I loved them. Roasted chunks of sweet potato drizzled with olive oil and sprinkled with salt, pepper, and rosemary. It was like a perfect marriage of flavors. Nowadays I like all forms of sweet potatoes, even the sweet ones I didn’t like when I was younger, but I still have a special spot in my heart for the flavor combination that changed everything. So when I was brainstorming new ways to feature sweet potatoes at Thanksgiving, I knew this would be a winner. 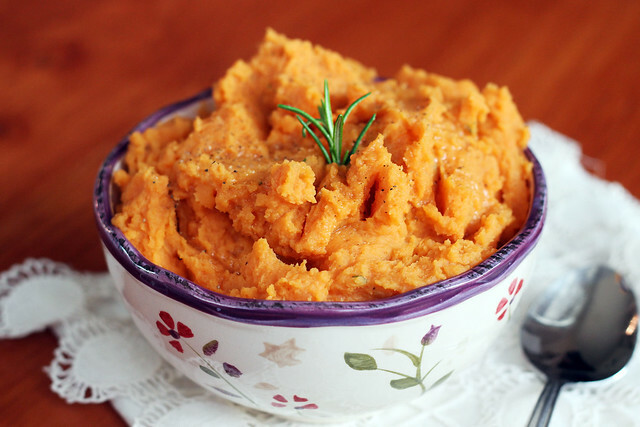 I am super happy with the way these mashed sweet potatoes turned out. Soft and fluffy with the yummy flavors that I love. 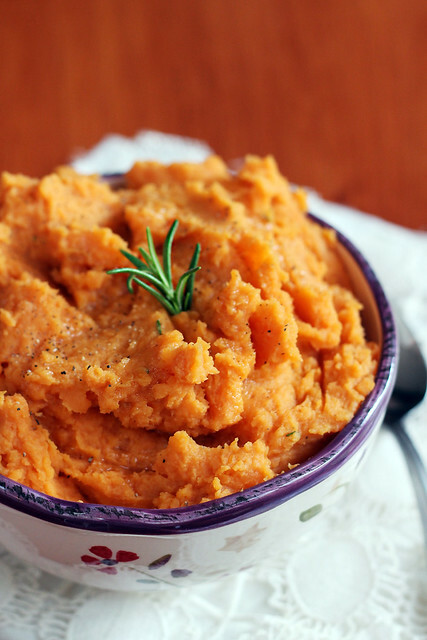 So, if you’re looking for a way to savory up your Thanksgiving sweet potatoes, look no further! *I use a lot of dry herbs but this is one of those situations when fresh is a must! Steam sweet potatoes until fork tender. Add the kosher salt (start with smaller amount and add the rest later if you think it needs it). Using a hand mixer on the lowest speed, start to “mash” the potatoes for about 30-45 seconds. Add the milk and olive oil and mix until it reaches your desired consistency. Alternatively you can use a hand masher for the entire process. Stir in the fresh rosemary and black. Serve hot with a drizzle of olive oil and sprinkle of fresh cracked pepper and kosher salt. *The recipe as written yields 3-4 servings. If you use this recipe for Thanksgiving you will probably want to double it! **You will notice that I use a lot of ranges in this recipe, that’s because you MUST do taste and texture tests along the way. I can not stress enough how important it is to taste as you go when you are making any kind of mashed potato! What only took 2 tablespoons of milk one time may take 3 tablespoons the next time because of variations in the potatoes. Taste, taste, taste, and taste! Also, please don’t whip and beat your potatoes into a sticky gummy mess just because a recipe says to mix for 45 seconds. Watch the potatoes breakdown and mix just until you get your perfect consistency.